Package dyeing machines are the most widely used now a days for dyeing of almost all type of yarns ,due to economical ,automatic and accurate dyeing results. The term package dyeing usually denotes for dyeing of any type yarn wound on the compressible dye springs/perforated solid dyeing tubes or cones. Yarn dyeing in package form is done at high temperature and under high pressure ,with the packages mounted on hollow spindles .These spindles are fixed on the dyeing carriers ,which is inserted into the dyeing vessel after closing the lid of the machine ,the dyeing liquor is forced through the packages in two way pattern (inside to out and outside to in) and goes on circulating throughout the vessel and yarn. Heat is applied to the dye liquor to achieve the dyeing temperature, time –temperature and flow reversal are controlled through a programmer. A series of technical developments in the recent years has resulted into package dyeing being developed into a highly sophisticated as well as an economic process. Latest design Package Dyeing machines are amenable to accurate control and automation. These features would likely to lead to increases in the application of package dyeing. The term package dyeing usually denotes for dyeing of yarn that has been wound on perforated cores. This helps in forcing the dye liquor through the package. With the start of dyeing cycle, the dye liquor goes on circulating throughout the vessel and tank. This happens till all the dye is used up or fully exhausted. The dye flows through to the yarn package with the help of the deliberate perforations in the tube package. Once full exhaustion is brought about, the carrier of coloured yarn is consequently removed from the vessel. A large centrifuge removes excess water from the packages. Finally the yarn is dried using an infra red drying oven. The image shows the process working of a Package dyeing machine. The material to be dyed is wound on the dye springs, perforated plastic cheeses or steel cones and loaded in the carrier spindles ,which are compressed and bolted at the top to make a uniform and homogeneous dyeing coloumn. The liquor containing dyes chemical and auxilliaries is forced through with the help of pump, and circulated through the material from inside –out and is reversed periodically so that each and every part of the material get the same and uniform treatment. The dyeing cycle is controlled through a micro computer and different chemicals may be added through the injector pump or color kitchen at any stage of dyeing. 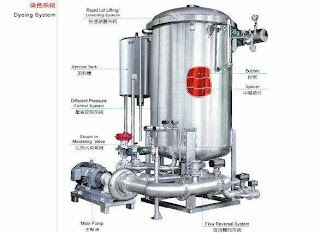 In case of fully flooded machines ,the liquor expands with the rise in temperature (approximately 5% volume increases from 30-130 degree centigrade temperature) is taken back in the expansion tank through a back cooler. This extra water is then again injected to the dyeing vessel through an injector pump. Expanded volume of the dye liquor is thus remains in continuous circulation in the system. Any type of addition can be done to the machine through the injector pump, the quantity and time of injection can be controlled through the programmer. In case of air pad machines ,the air above the liquor acts as a cushion ,which is compressed with the increase in liquor volume, the pressure is controlled by pre set pressure control valve .In air pad machines have an advantage ,that entire dye liquor participate in dyeing and dye exhaustion is perfect. 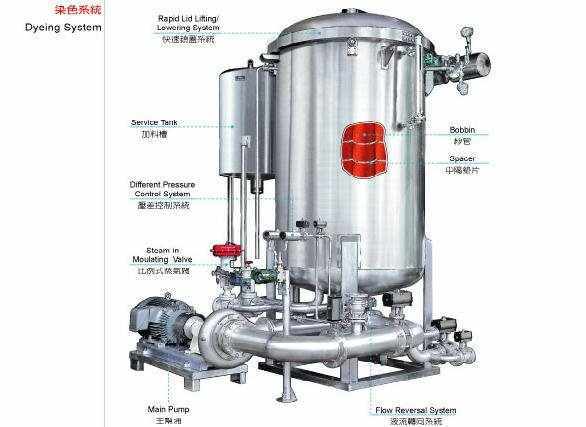 In case some addition has to be done in air pad machines , if the machine temperature is less than 80 degrees ,the liquor is taken back by back transfer valve to addition tank ,and injected back to machine vessel. If the machine temperature is above 80 Degree then cooling has to be done to bring down the machine temperature. Air pad technology is possible in all types of machines such as vertical kier, horizontal kier and tubular dyeing machines. The material after dyeing is washed and finished properly in the same machine and taken out hydro extracted or pressure extracted in the same machine and dried subsequently. Package dyeing methodologies have been subjected to intensive research and development. As a result package dyeing machine has evolved into a very sophisticated apparatus. It offers a number of advantages. Considerable reduction in yarn handling. Compatible to automatic control, in the process leading to reproducible dyeing‟s. High temperature dyeing a possibility. Low liquor ratios, giving savings in water, effluent and energy. Uniform and High rates of liquor circulation, that leads to level application of dyes. Machinery totally enclosed resulting in good working conditions at the dye-house. These machines have a vertical cylindrical dyeing kier, in which material loaded into carriers with vertical perforated spindles, is dyed .The machine could be fully flooded or air pad type .These are high pressure machines and suitable up to 1350C temperature dyeing. These machines are similar to vertical type machines in which the cylindrical dyeing kier is in horizontal position. The dyeing carriers with vertical spindles are used in these machines, which are inserted into the machine via trolleys. These machines are erected at the ground level and hence do not need an overhead hoist as well as platform, thus making the dyehouse design and layout is simple. These machines may be of vertical or horizontal type ,and have one or many tubes acting as small dyeing vessels, each with a single individual spindle. The spindle is taken out of the tube ,loaded and then inserted back into it. These machines can be operated either fully loaded tubes or to partial loads by using dummies. Since all individual tubes in a machine are connected and serviced by a main pump, therefore it is also possible to operate as many tube as required and disconnecting others. These machines can be erected at ground level and hence do not need a platform or hoist. These machines are most flexible as for as the capacity variation is concerned ,without altering the material to liquor ratio.